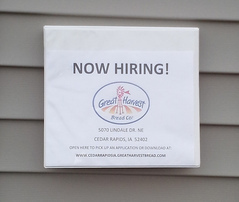 Great Harvest Bread Co. is a crew of fun-loving bakers, sandwich makers and more importantly "people-people". We work hard and we love what we do. If you like making people feel welcome and are excited about learning to bake healthy and delicious bread and sweets by all means fill out an application. We have an immediate need for at least two customer service people who will need to learn to knead bread and shape loaves as well. Download an application here or stop in and pick up an application today. Drop it in the mail or stop by and enjoy a free slice of bread! Hope to see you soon! We have retired the application notebook for now, but I already feel a little nostalgic about this photo. The notebook brought us several of our wonderful Great Harvest team.